The 790-foot tall 200 Clarendon, also known as the John Hancock Tower, ranks first among the many tall buildings in Boston, Massachusetts, U.S.A. The first high-rise building in Boston was built in 1893 and had 13 floors. Architects and engineers have since developed even taller buildings. Today, 18 skyscrapers above 492 feet in height can be found in this New England city. This number makes Boston home to the highest number of skyscrapers in the New England region. The majority of its high-rise buildings are located in the Financial District and Back Bay areas of the city. This article takes a look at the tallest buildings in Boston. Built in 1976, the 200 Clarendon building is the tallest in the city and the New England region. It stands at 790 feet tall and has 60 floors. Locals sometimes refer to the building as the “John Hancock Tower” after its major tenant, John Hancock Insurance. Designers for 200 Clarendon followed a popular 1970’s style of tall and thin glass skyscrapers that today, gives it a modern, minimalist look. This building once offered visitors an observation tower that looked out over the city, but since the tragedy of September 11, 2001, it has been closed to public use. 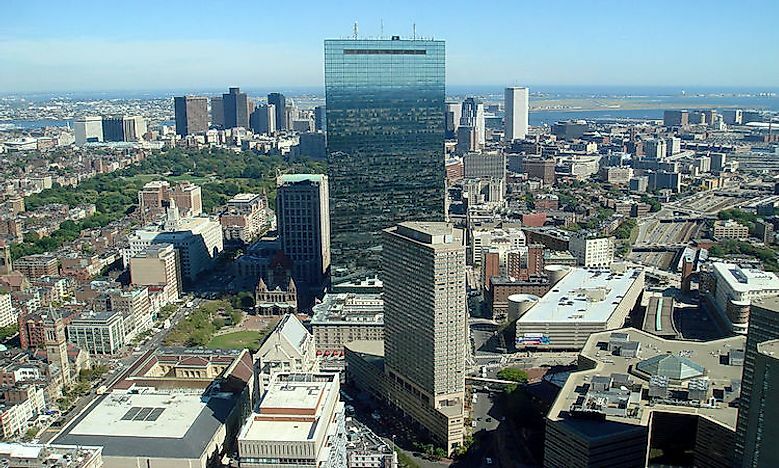 The Prudential Tower looks over Boston from a height of 749 feet. Finished in 1964, this building houses 52 floors which include offices, a restaurant, and an observation deck. The observation deck is located on the 50th floor and is the highest in the region. Boston residents recognize the building due to its window lights displays which often spell out supportive messages for the local sporting teams. Major tenants include Ropes & Gray (a local law firm), Partners Healthcare, and Home State Corporation. Standing at 614 feet tall, the Federal Reserve Bank Building ranks third among the tallest buildings in Boston. Construction on this building finished in 1977, and its 32 floors rise above a 140-foot suspended bridge that connects the two end pieces of the tower. The Federal Reserve Building is recognized for its very secure design. One of the newest buildings on the list of the "Tallest Buildings In Boston," the Millennium Tower has a height of 685 feet which holds 60 floors. This skyscraper is a luxury condo with more than 420 residences. Residents began moving into their homes in July of 2016. The space where the building sits was once planned for other uses in a failed project. Construction of the Millennium Tower began in September 2013 and holds the record for the city’s largest pouring of concrete, 6,000 cubic yards. The building has caught the attention of many international investors including people from China, Greece, Hong Kong, and the Middle East. One Boston Place is a 601-foot office building with 41 floors. This skyscraper is the 5th tallest in the city and has a unique architectural design. Residents recognize the building because of its geometric shapes on the outside and because of the smaller box-like construction on the rooftop. It has been considered an architectural example of structural expressionism. Since its completion in 1970, the offices have held law firms, real estate offices, and financial corporations. Inside of One Boston Place are 18 passenger elevators and one cargo elevator. Notably, this building was the first in the world to earn the gold standard certification from the US Green Building Council’s Leadership in Energy & Environmental Design (LEED) for existing buildings. Some of the features that earned it the recognition include: an all white rooftop to reflect heat, native plants in the plaza, and high indoor air quality.